Stanza Performances. Using custom software 2004. 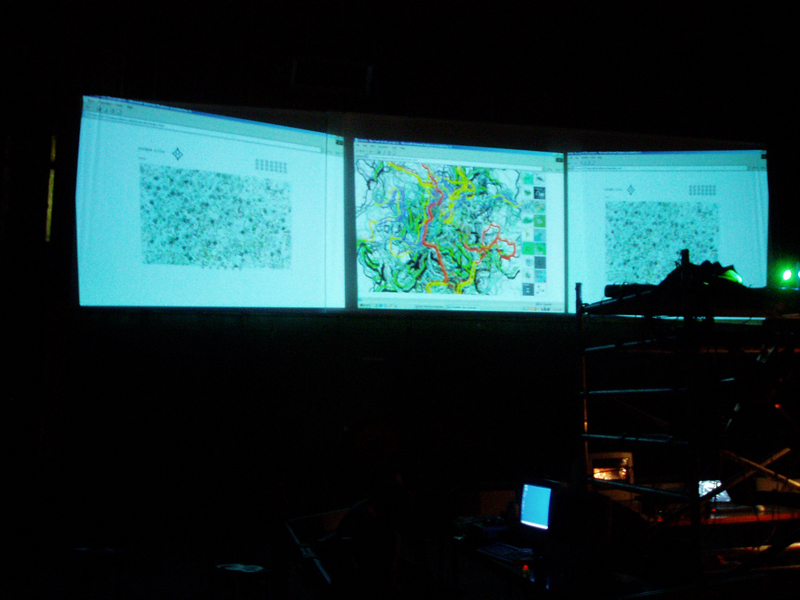 These performaces use custom software artworks onto multiple projectors creating a unique audio visual space. 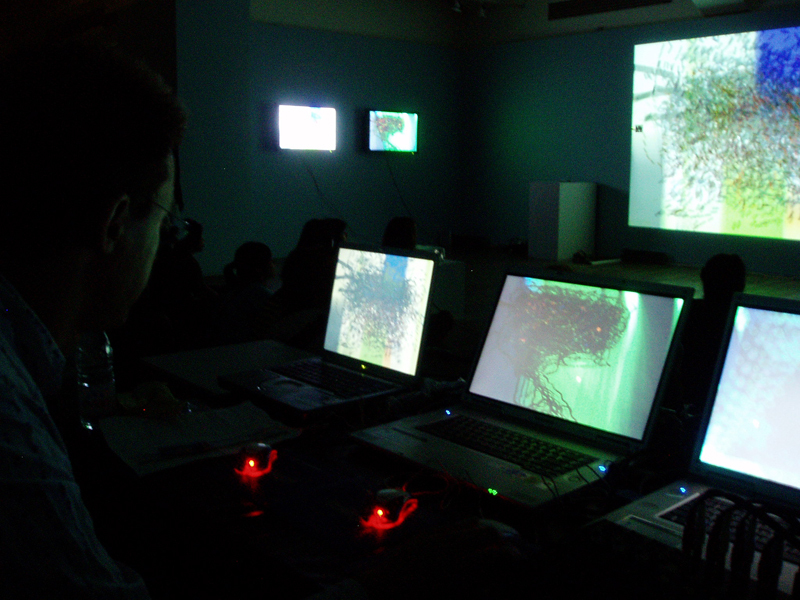 The most recent performances uses six data projectors and four custom built 20 inch touch screens to trigger the screens. The Museo Tamayo in Mexico City. 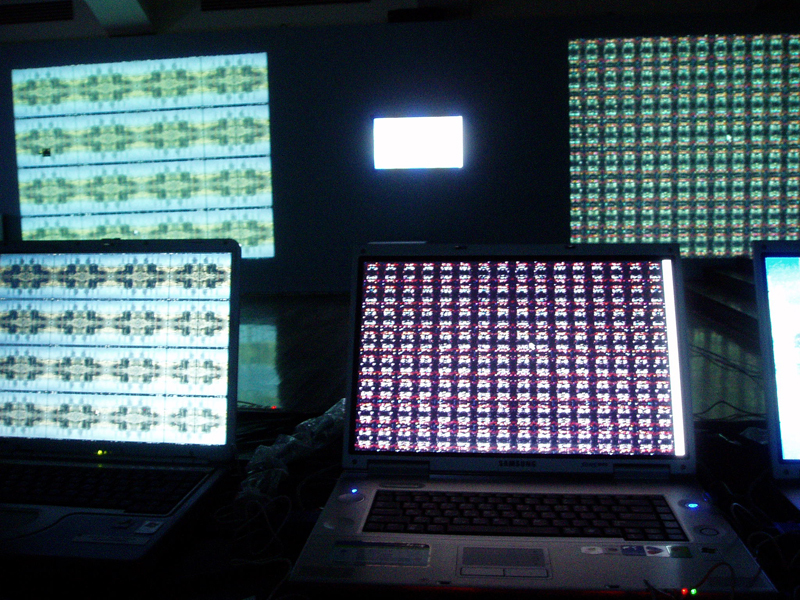 The digital generative custom coded software are projected to at least eight projectors connected to touch screens or latops . The sounds are generating and they are fed into custom made software. This is a more ambient and colourful performance. 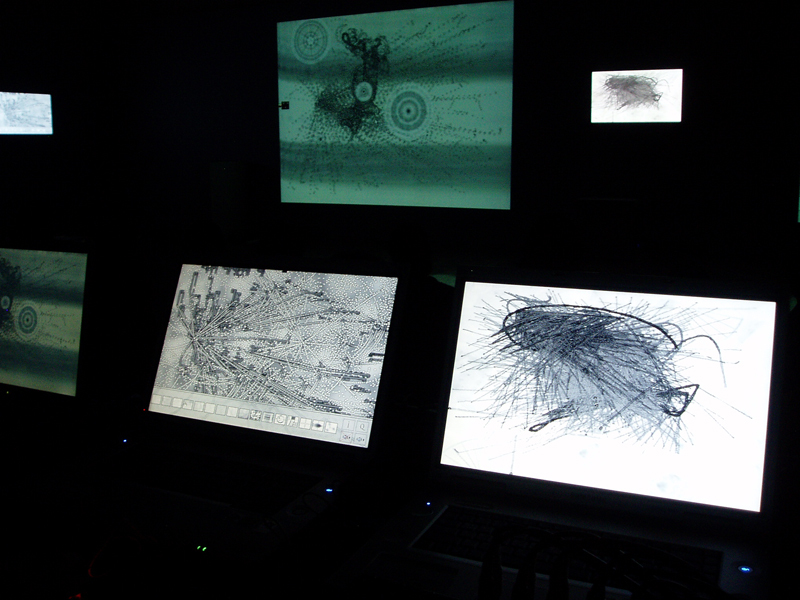 They are digital paintings exposed as a generative and ambient event. The performances can also use four custom made touch screens which enables the audienc to come up and interact in the performance. 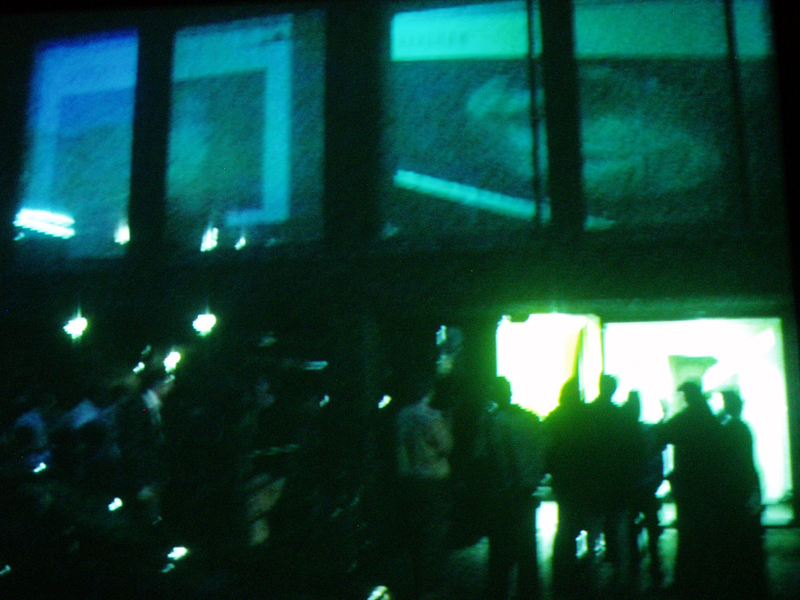 The performance mixes a network of cameras in the performance space, with outside CCTV cameras, to make re-contextualising these images and sounds in real time. The result is a real time audio visual performative spectacle. 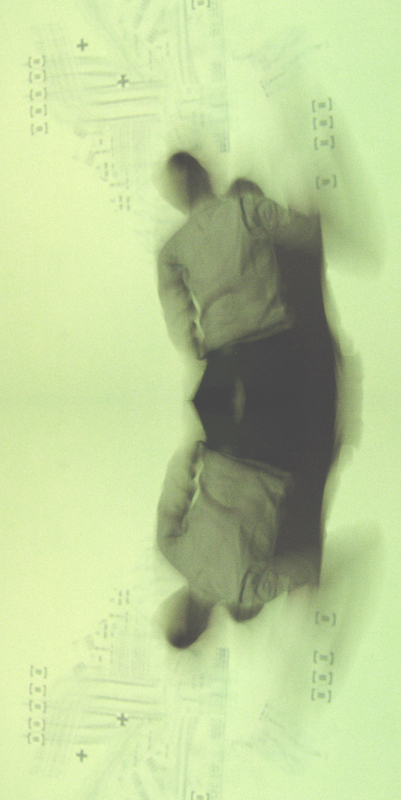 The images gathered are fused with Stanza’s coded audio visual experiments using CCTV systems. Global live cctv cameras will also be mixed in , grabbing these images in real time off the internet. 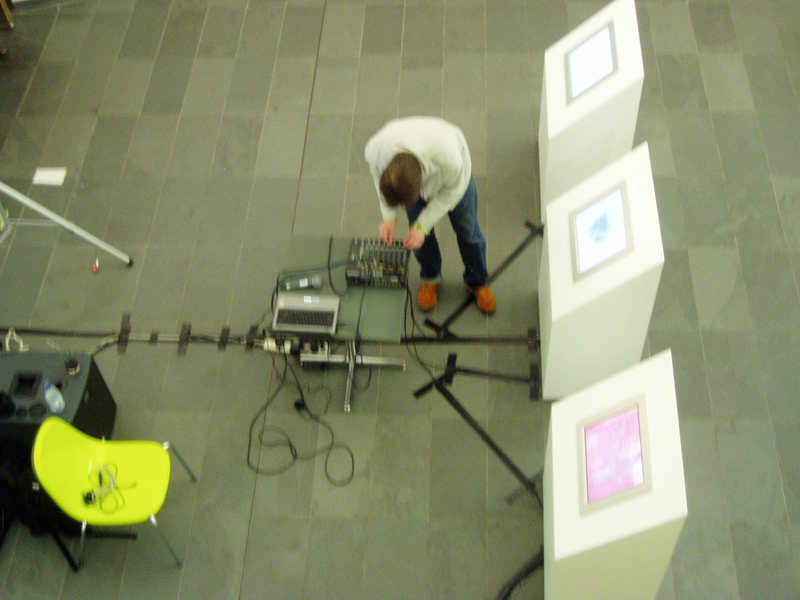 The work incorporates city soundscapes and found sounds that are processed and mixed into a performance. The inside of the space uses wireless cameras so that the public become part of the performative space. The artwork uses images from the cameras and blends them together to make a collage, a real time image of the city space. Please note as opposed to a recorded process this is a real time experience. 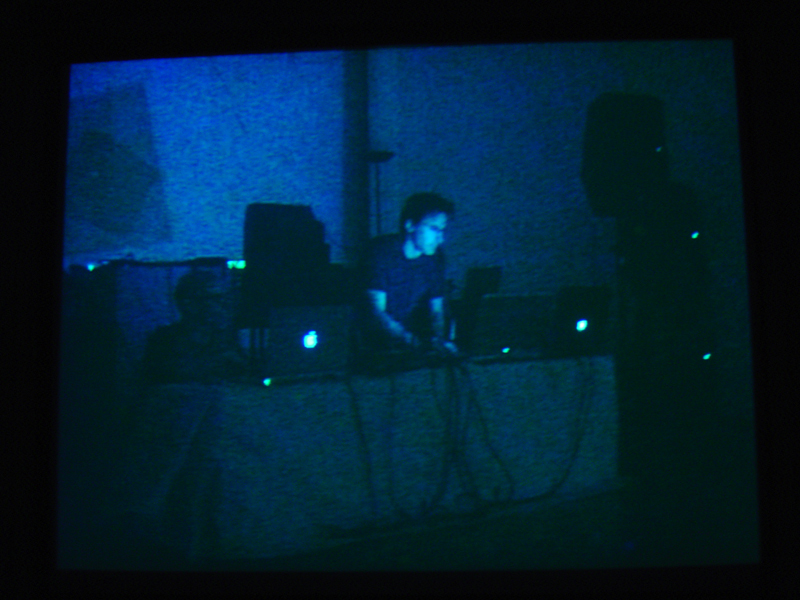 Performed at DanaCentre London 2005 and also as part of Node london in Peckham 2006. Soundcities performance uses sounds from my www.soundcities.com website. SOUNDCITIES DATABASE: http://www.soundcities.com/global/enter.php. An online open source database of city sounds from around the world, that can be listened to, used in performances on laptops, or played on mobiles via wireless networks. The performance mixes a network of CCTV cameras, to re-contextualize these images and sounds in real time. The result is a real time audio visual performative spectacle. 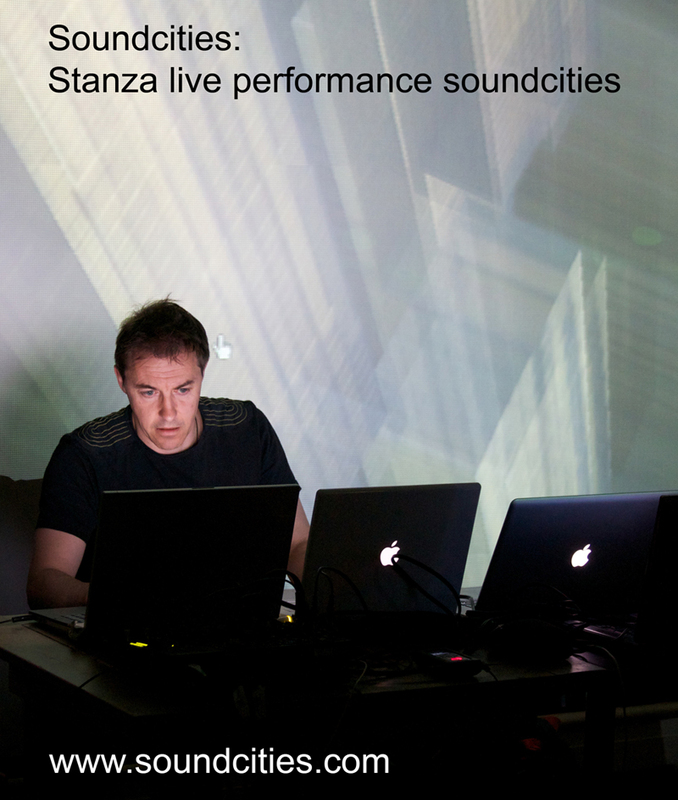 The images gathered are fused with Stanza’s coded audio visual experiments using CCTV systems. Global live cctv cameras are mixed in , grabbing these images in real time off the internet. 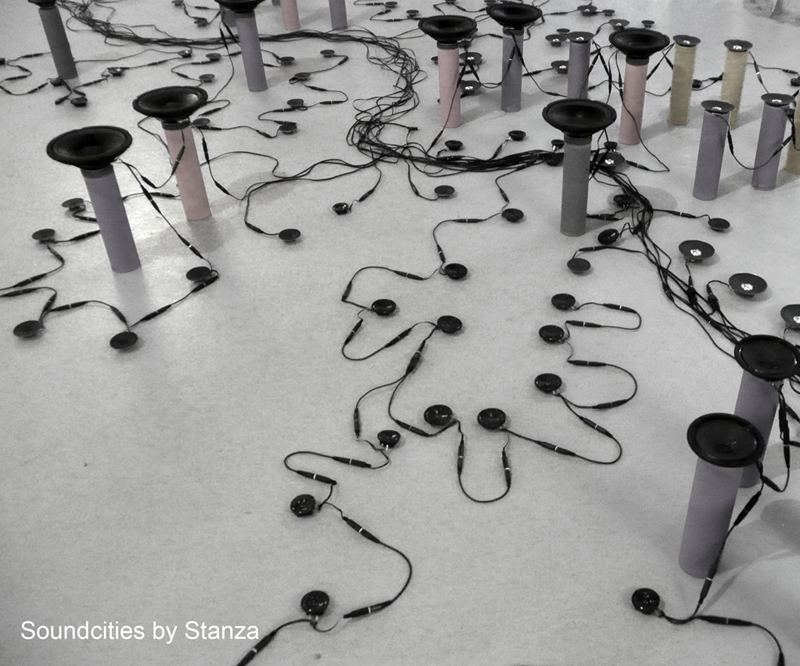 The work incorporates city soundscapes and found sounds that are processed and mixed into a performance. 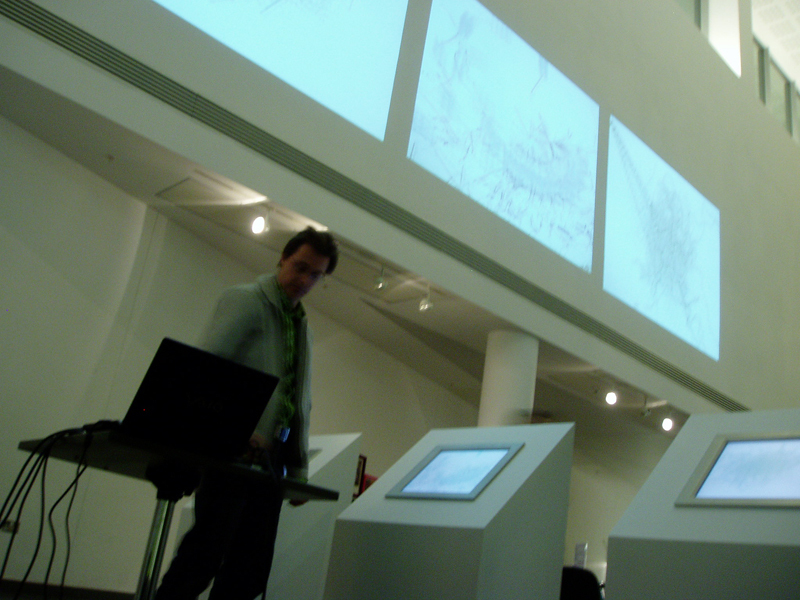 Mixing, 'the central city', applications and websites on three laptops to generate sound control data and image data. Live and dynamic net connections input new images into the mixed visual stream. The visual element comes from the website the central city (www.thecentralcity.co.uk) "central city" and "inner city" or from the new "soundmaps" and "visual cities" series. The output sounds are then remixed. Music and art performances copyright (c) 1982 - 2014 Stanza All artists rights reserved.